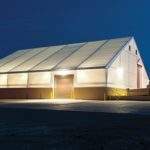 Legacy Building Solutions manufactures sustainable fabric structures for a variety of industries and has installations worldwide. 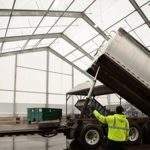 With modern tension fabric structures on a rigid steel frame, there are a range of sustainable properties of fabric buildings, including natural lighting. Fabric is a non-corrosive building material and will last longer than steel when used in a harsh environment or when storing corrosive materials such as fertiliser. The hot-dip galvanised steel frame is coated with zinc to resist rust. Adding a fabric liner keeps the corrosive elements completely out of contact with the steel, meaning there is no way for fabric cladding to rust. This adds years to the useful life of the building. All architectural fabric has some degree of translucency, allowing sunlight to stream in through the walls and ceilings. On a sunny day, there is typically enough daylight to work inside the building without artificial lighting and at night and on cloudy days the lighting is multiplied by the fabric cladding. Relying on sunlight or daylighting saves money and reduces the amount of energy consumed by the building. Daylighting also creates a natural-feeling environment and a pleasant space for people and animals. Polyethylene (PE) fabric is considered a low-emitting building material, resulting in better air quality inside the structure. In most cases, PE cladding is recyclable. There are no other materials used in PE cladding, so there is nothing to separate before recycling. The steel used for the structure of the fabric structure is, on average, 89.5% recycled content. Fabric naturally has a high solar reflectance and architectural fabric naturally reflects sunlight and heat away from the building, reducing the roof temperature. It also has a high thermal emittance. A high solar reflectance and thermal emittance combine to keep the building 28°C to 33°C cooler during warm weather. Unlike building materials such as steel, fabric is naturally non-conductive. Instead of magnifying the outside temperature, fabric membranes hold the inside temperature. This means that the building is more than 10°C warmer on many winter days and almost 20 °C cooler on most hot days, even before adding insulation and climate control systems. Fabric structures are available in a variety of colours, with white the most popular option. These are naturally cooler than other roofs. Fabric buildings have numerous sustainability benefits and are a simple way to ‘go green’. Legacy Building Solutions has employed a new sales vice-president Eric Donnay, who will lead the sales team's vision and direction to help grow the company. Legacy Building Solutions patented technology allows you to design a structure specific to your operational needs. Based on best practices and lessons learned from industry research and direct experience with thousands of fabric building installations, this white paper draws on conclusions made by CEOs, project managers, engineers, installers and end-users. Corrosion is the deterioration of metal caused by the reaction of metal with the environment. The word 'corrode' literally means 'to gnaw to pieces'. Current economic conditions have created an urgent demand for high-quality industrial structures. By selecting Legacy Building Solutions, you are not only receiving a configurable fabric building with multiple foundation options, you're selecting a dynamic structural steel facility tailored to your exact specifications. Legacy Building Solutions is introducing its new PVC ExxoTec™ fabric to its tailored tension fabric structure range. Being the first to market is a good way to gain access in many industries today, especially in the fast-moving fracking business, however, being first isn't enough. 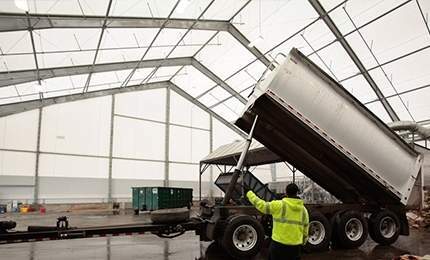 US-based Central Valley, a retail and wholesale distributor of fertiliser based in Tamora, Nebraska, needed to replace a storage building after the original had been badly damaged by rust and wind corrosion. 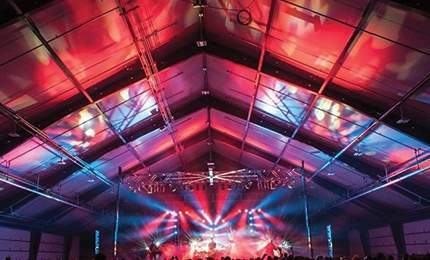 Legacy Building Solutions, a nationwide and international manufacturer of custom tension fabric structures on a rigid steel frame, has recently been ranked on the Engineering News-Record Top 600 Specialty Contractors list for the third year in a row. Legacy's 2016 ranking is 540, an increase from each of the previous two years. The US Tennis Association (USTA), the national governing body for the sport of tennis, has announced their 2016 Outstanding Facility Awards. 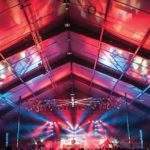 Legacy Building Solutions, a pioneer in the use of a rigid steel frame for fabric structures, announces it has earned the position of 1952 on the 2016 Inc. 5000 fastest-growing private companies in America. Getting out of the sun's rays immediately feels up to 15° cooler than being in direct sunlight, despite the fact that shade doesn't technically lower the temperature. 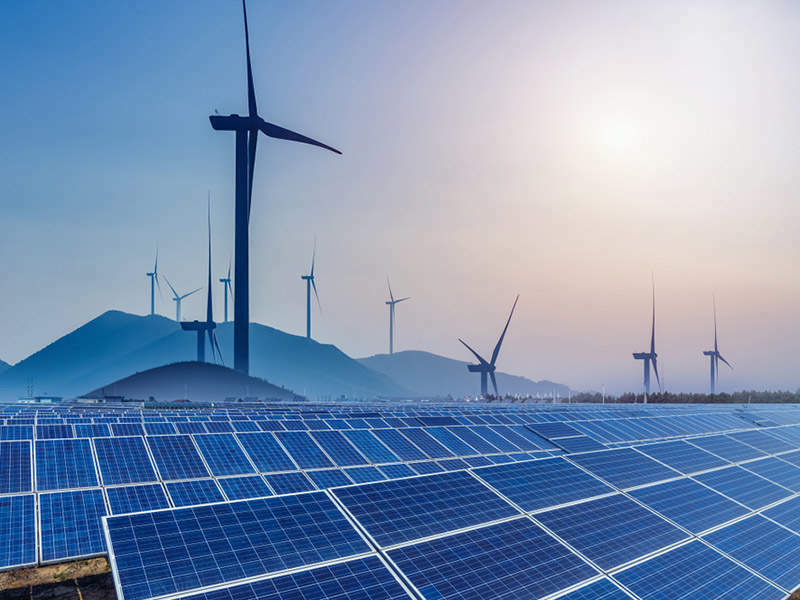 The Solar Ship Brantford off-grid hangar, a joint venture with Legacy Building Solutions, Canadian Energy and Solar Ship has been named the 'Game Changer Project of the Year' by Canadian Solar Industries Association (CanSIA). Legacy Building Solutions is proud to announce the Solar Ship Brantford off-grid hangar, a joint venture with Canadian Energy and Solar Ship, has been awarded the 'Game Changer Project of the Year' by Canadian Solar Industries Association (CanSIA). Considering a fabric structure in a new project or currently involved with writing a spec for a fabric building? We're ready to talk trash at WasteExpo. 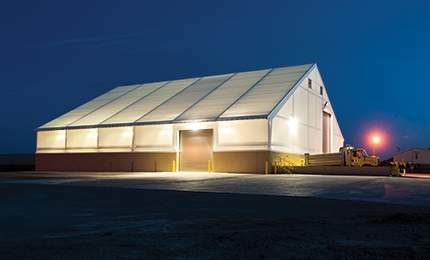 Specifically, we're ready to discuss how Legacy fabric structures simplify storing and handling trash, recyclables, biomass, wastewater, compost, MSW, hazardous materials, and other waste. Legacy Building Solutions has opened a new satellite office in Santiago, Chile. 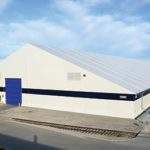 Legacy Building Solutions, a specialist in sustainable fabric structures, is holding a webinar on Wednesday 11 February on the causes of different corrosion types and how they impact industrial buildings. Legacy Building Solutions, a design-build manufacturer of custom fabric structures, has appointed Jim Kumpula as general manager - Canada. Portland Yacht Services has opened a new facility for boat storage and maintenance at its new location on the western end of the waterfront in Portland, Maine, US. 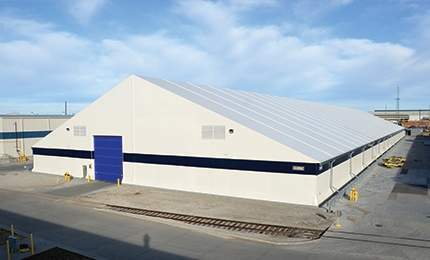 The new tension fabric building was custom designed and constructed by Legacy Building Solutions.